Phew! Well, this took a while, didn’t it? Better late than never, I guess! If you’ve followed my progress on Instagram, then you’ve seen the whole saga unfold right before your eyes. I hope it was entertaining at least! But for those who missed it, or aren’t following me on Instagram, here is the breakdown of what went down since Part 1! In the first installment, I had just finished sewing the top and leggings of the costume. In that time, I decided that I would sew the cowl rather than fabricate one out of foam and Plasti-Dip. The cowl was, by far, the most challenging part of this cosplay. The eye piece alone took me three tries to perfect, and trying to sew small parts out of satin was a feat. 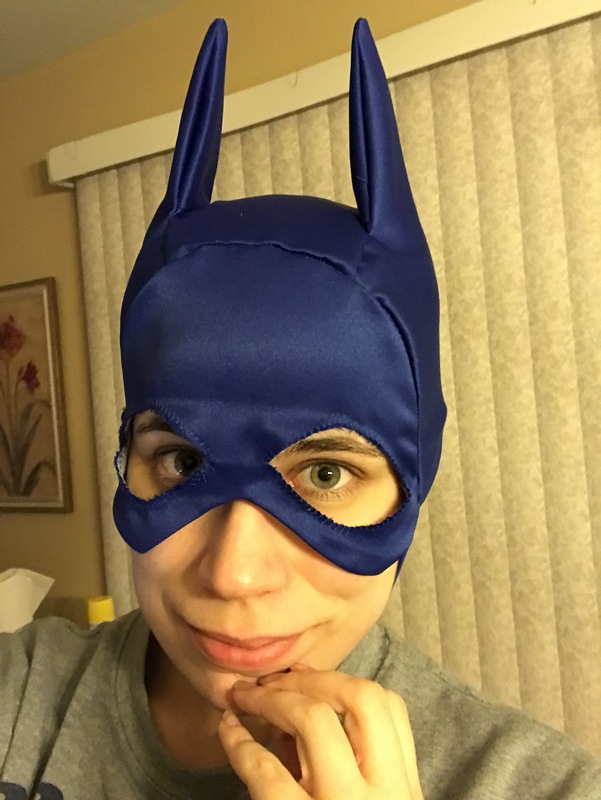 Eventually, I finally got a viable eye piece, and finished sewing the cowl. The pattern called for the use of clear elastic along the bottom hem line of the cowl, which I decided not to do since I had made the piece out of satin rather than stretch knit. In the end, I liked it better that way. To finish it, I added snaps to the chin strap portion of the cowl, and I was done with this portion of the cosplay! I found several online that had pouches, but I wanted to try to stay as true to the costume as I could. The main hiccup came from those capsules that adorn the belt; where I would find pre-made, capsule-like items was the mystery. After many discussions with other cosplay friends, I had a thought about Nerf bullets. So, I looked them up on Amazon and found Mega Nerf bullets, which turned out to be the perfect size and width. 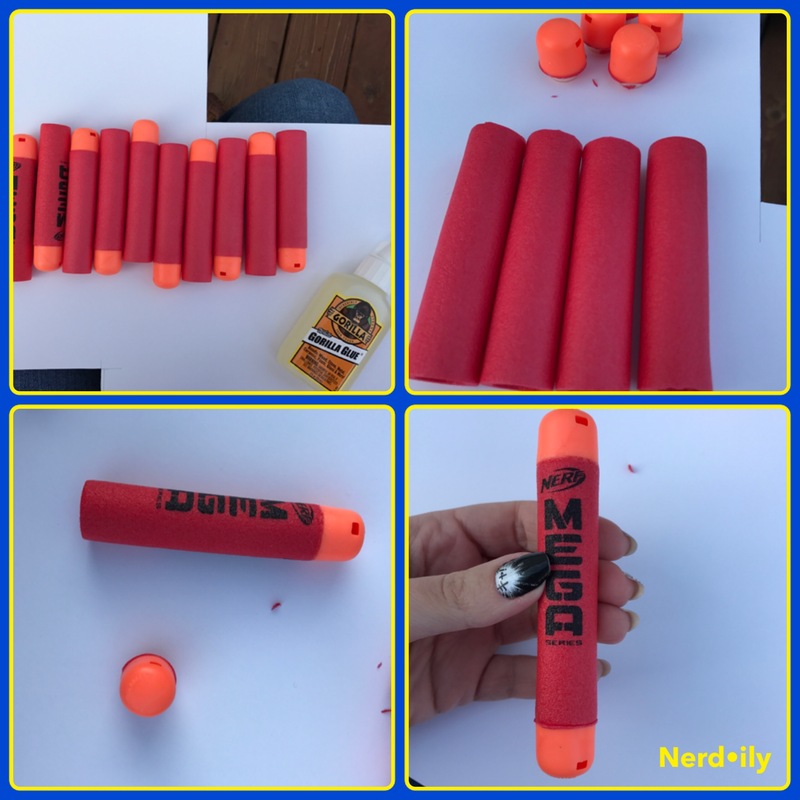 After purchasing a giant pack of these Mega Nerf darts, I cut the rubber tips off one set and glued them onto the bottom of whole bullets with Gorilla Glue. 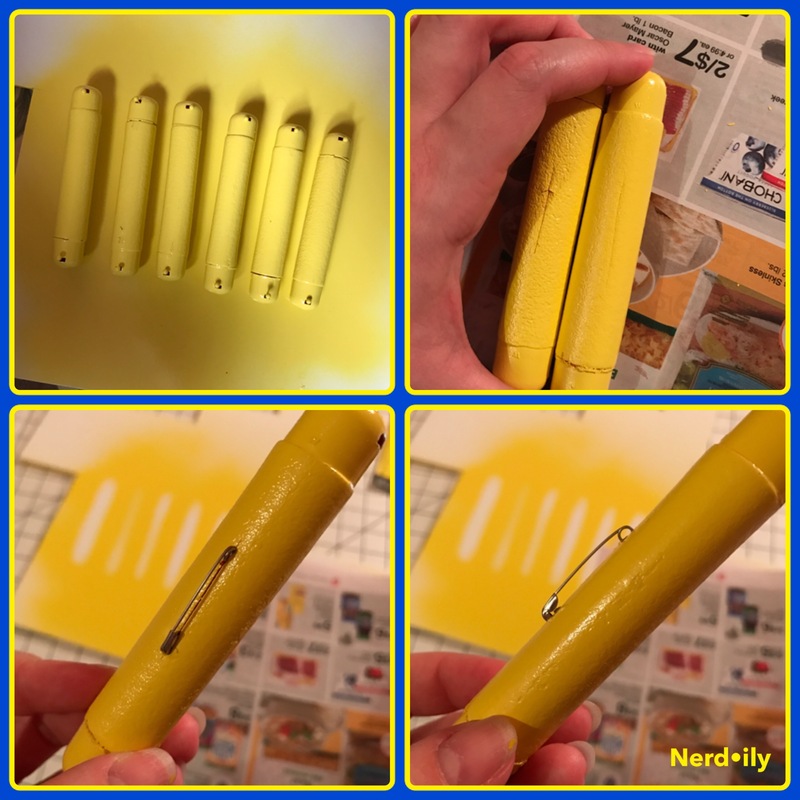 After the glue had cured, I decided to paint the Nerf bullets with Rust-o-leum spray paint. I purchased the type that could adhere to plastic. In the end, that chipped off as I was walking around the convention. When I redo this portion of the belt, I will most definitely use Plasti-Dip instead. Once they had completely dried, I took a craft knife, cut a slit in one side of each, and then adhered safety pins into the back. I used safety pins because, once the actual belt was fabricated, it would be covered in stretch knit. The belt itself was made with a craft foam base, and then wrapped in the aforementioned knit fabric. The large sheets of white craft foam (super cheap at a craft store), which I cut into rectangles 4″ wide. After gluing these pieces together with Gorilla Glue, I had to figure out how I was going to cover it with the fabric. This is the portion of the account where I will say numerous times that I truly wish I had yellow vinyl fabric. It would have lent itself to the belt aesthetic, but I had to work with the materials I had. I wound up cutting a piece of yellow knit fabric double the width and two inches longer than the foam belt. I folded the fabric over the length of the belt, and then sewed it into place. Pro tip: yes, you can actually sew through craft foam, as long as you turn up the tension on your machine. 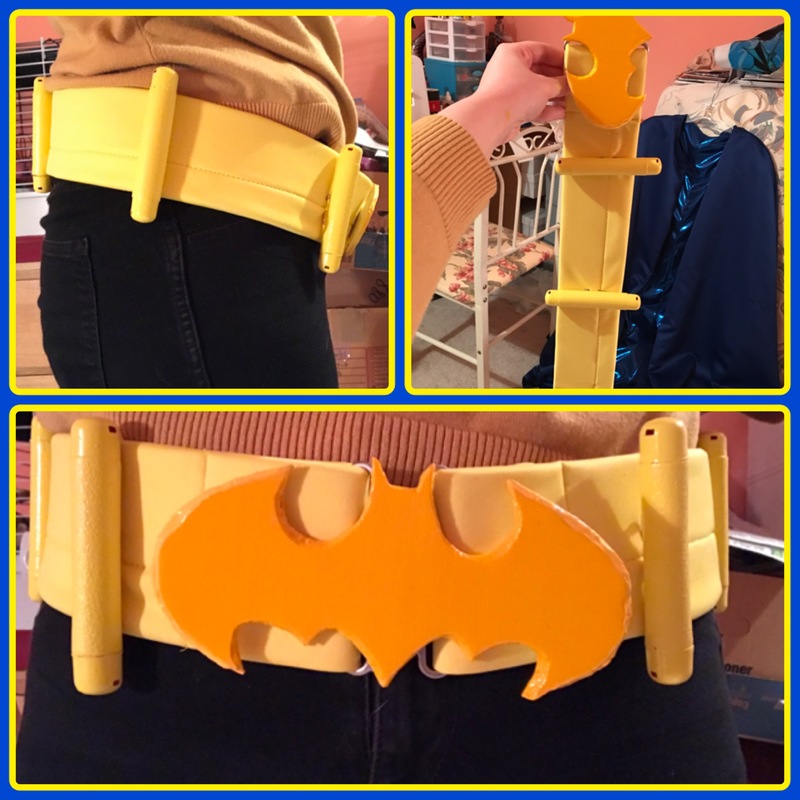 Once the fabric was in place, I used the longer ends to fold into an already-made Bat insignia buckle I had made a few years earlier, and sewed those into place. Then all I had to do was pin the capsules on and my belt was complete. If you’ve ever made your own gloves, then you know how utterly tedious of a process it is. Well, that was the case with my pair of Batgirl gloves. The pattern called for the alteration of a pre-made pair of yellow gloves, which would have been expensive in the long run. Instead, after consulting many Pinterest and YouTube tutorials, I resolved to make my own. After a great many mock-ups and practice runs, I felt ready to make my own. 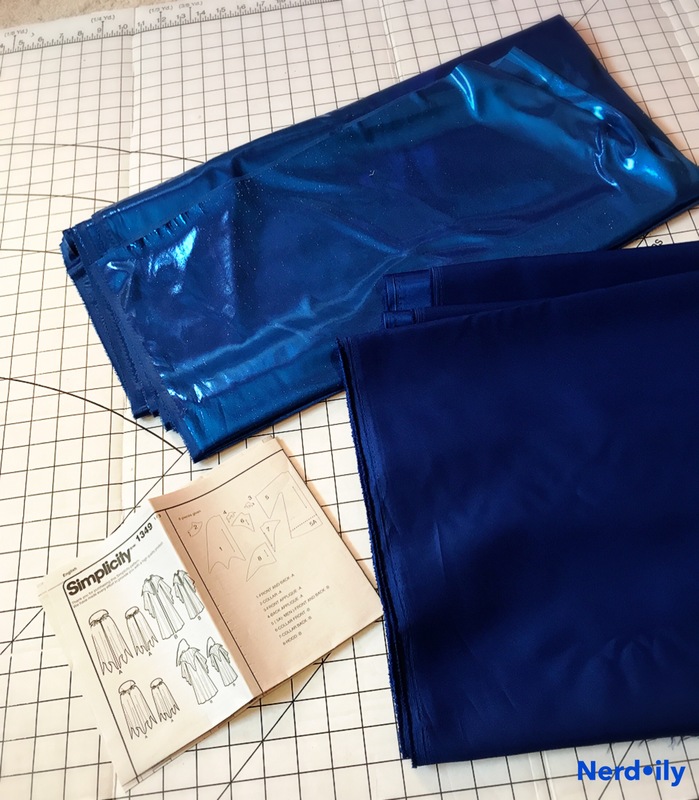 I splurged and bought some Yaya Han 4-way stretch spandex, which saved me in the long run. Any time you have to make your own stretchy clothing, always splurge on the stretch material. A few alterations later, and I had a lovely pair of yellow gloves. The fins on the sides of each arm were made with yellow felt. 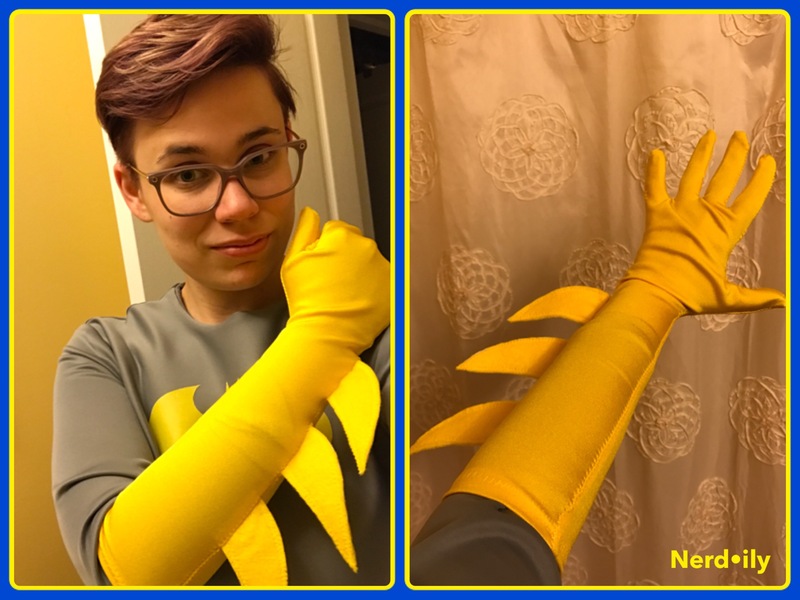 Again, I wish I had used yellow vinyl, because i think the look would have been extra superhero-y, but I couldn’t find any, so felt it was! The boots are perhaps my least favorite part of my cosplay, mainly because it took so long to paint them, and when they were done they didn’t turn out nearly as well as I would have liked. 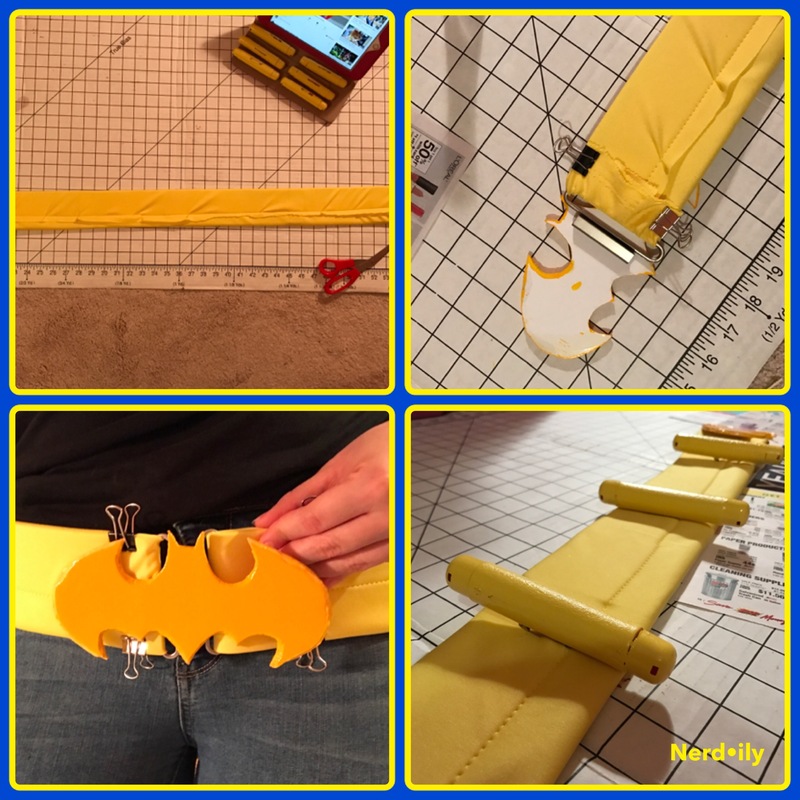 The Batgirl patten did come with a portion for making your own boot covers, but I didn’t know if I wanted to sew another piece to my cosplay, and I was unsure of how they would turn out. I should’ve sucked it up and attempted them, because painting the boots I wore took the longest out of any piece I made for this cosplay. 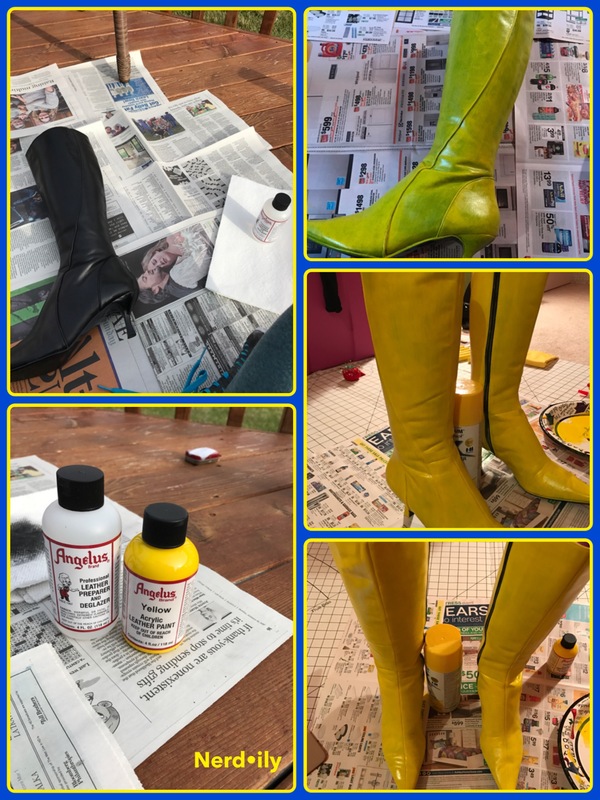 After some shopping around, I decided to use a pair of old knee-high boots I got from Goodwill years ago and paint them using Angelus leather paint and De-Glazer. The paint itself performed well, but I didn’t use a primer before I started adding coats of yellow paint, so the process took about 10 coats in total. At the last minute, I decided that I should probably get a finishing paint to seal and protect my paint job. I went with a gloss finish, which made the boots feel sticky, and ultimately the paint cracked and peeled away on the day of the convention. The moral of the story here is this: practice good painting techniques to ensure the life of your painted piece lasts. It was complete user error here, and now I know better for next time. I was the most nervous about completing this piece, because I was using a great quantity of blue satin, and I didn’t want to screw anything up. In the end, it’s my favorite part of the cosplay by far. 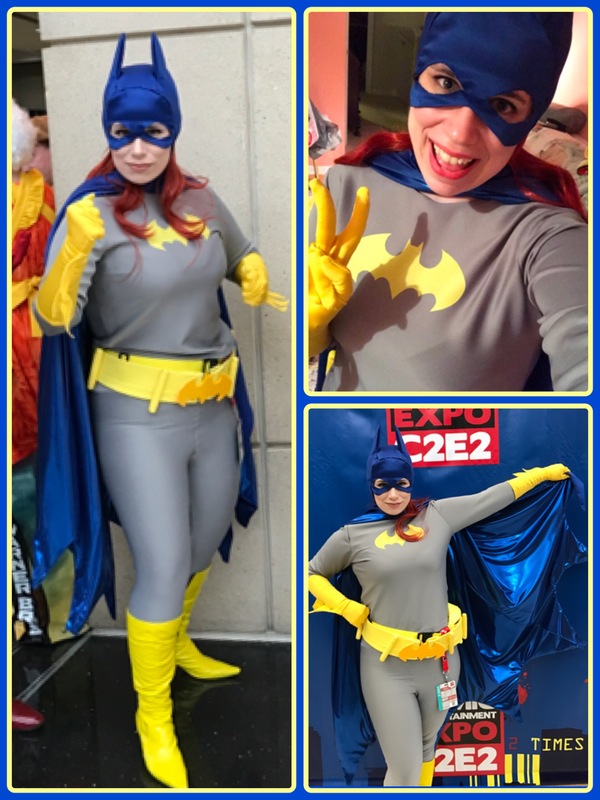 For the cape, I actually used a different cape pattern, rather than the half cape that was included in the Batgirl costume one (#1349 in size S/M). It’s basically a Dracula cape pattern, so I had to do some modifications for it to work. First of all, I wasn’t going to make a collar for the cape, seeing as how Batgirl’s doesn’t necessarily have one. Next, I had to pick lightweight materials to use, because this was going to be a big piece. Originally, I wasn’t planning on lining the cape, but that would have required A LOT of hemming, and I absolutely hate hemming. So my mom recommended that I use an even lighter material for the lining. In the end, we found a beautiful lamé in the same color. This would create an impressive effect when I opened up my cape. To secure the cape as I wore it, I added snaps on either side of the neck opening so that it would fold over nicely around my shoulders. As much as I love this cape, I will say that this pattern makes for one GIGANTIC piece. Its wingspan (pun intended) was enormous–I’m guessing at least 5 feet–and the length was perfectly long without dragging. Just be warned if you pick up this pattern that you’ll use a lot of material and gain a huge piece of garment. Despite this cosplay taking me quite a while to complete, and a host of hiccups along the way, I am exceptionally proud of this cosplay. Any cosplay or costume is going to come with some sort of issue, but you just have to learn to work with what you’ve got and do the best you can. I already know that there will be pieces I’ll need to repair and replace, but that’s part of the fun. I now have excuses to upgrade to better materials! 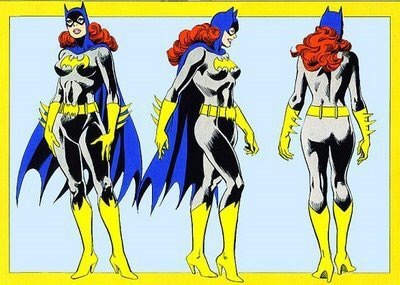 Pattern-wise, I would recommend both the Batgirl costume and the cape pattern, though be wary that you may have to modify a bit. In particular, the leggings were cut much too short in the waist, but I added an additional 4″ with a wide waistband and the problem is solved. now I use that pattern for all of my leggings. The cape is magnificent when it’s put together, but if you’re tiny, you will drown in it. Anyway, I think this is the end of this rather lengthy post! If you have any questions about my cosplay, or the process, feel free to comment below with questions, send me a message on my Facebook page, or tweet me! Or you can always check out my past cosplays and my DIY tips for some inspiration. Also, let me know what you think about my cosplay, if you cosplay, or have ever thought about cosplaying down below so we can nerd out! Thanks for joining me on this wild ride, and here’s to the next cosplay! I’m so excited to see the full, finished product – I was following along on Instagram. I love it! Omg, this was so cool! I was just thinking the other day of doing a casual Batgirl costume. Now I want to do the whole thing. The whole cosplay is so cool, but I’m obsessed with that belt. Awesome job! Thank you so much!! 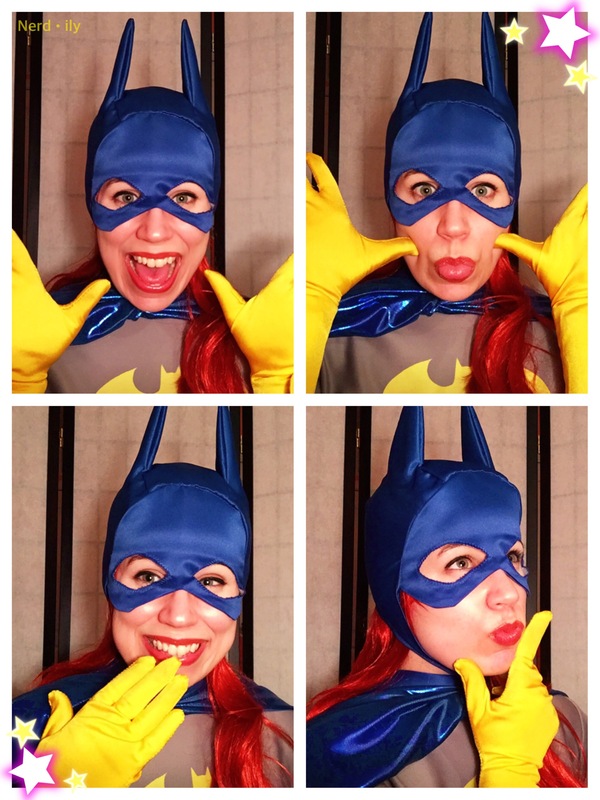 If you do Casual Batgirl let me know! Thank you!! It was definitely a labor of love but I’m so happy that I got to make it! Wow! You’re my hero now O.o You have all the patience I lack to even try to make the first stitch! O.o All my admiration goes to you right now! Your praise is too kind!! ☺️☺️ thank you! I loved following along on Insta and reading the recap it’s still just as awesome!! I can’t believe you made this whole thing from scratch!! So amazing – way to go!